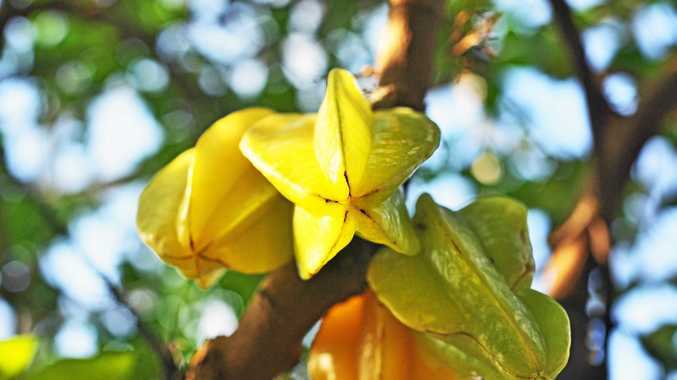 Carambola (Averrhoa carambola), also known as star fruit, is easily recognisable by its five-pointed star-shaped yellow fruit and is an eye-catching, juicy and tangy addition to fruit salads, as well as chutney, juices, jams and tarts. This is an evergreen, slow growing fruit tree for medium-sized sub-tropical and tropical gardens, growing up to eight-metres tall in ideal conditions. Carambola is an attractive tree with pretty pink flowers and can produce lots of fruit between autumn and spring once they are established (which can take several years). Pollination and fruit set will be improved by planting two trees. Carambola trees need a warm spot with rich moist but well drained soil. When planting a new carambola tree, enrich the soil in the planting hole with a soil improver and plant fertiliser and keep the new tree well-watered while it establishes.